The HD10MD4 converts 1080p24 or 1080p24sf to 59.94 Hz output video using the standard 3:2 pulldown technique. The output can be formatted for either 4:3 or 16:9 standard definition monitors. 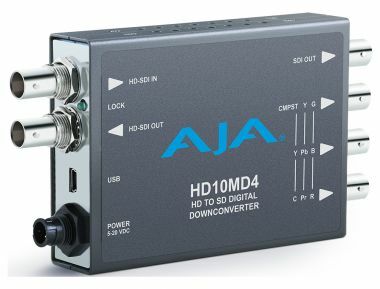 Utilizing a full 10-bit data path and AJA's high-quality scaling technology, HD10MD4 maintains the most detail possible to ensure a quality conversion at an extraordinary price.